Dark Quest, LLC, 9781937051761, 254pp. 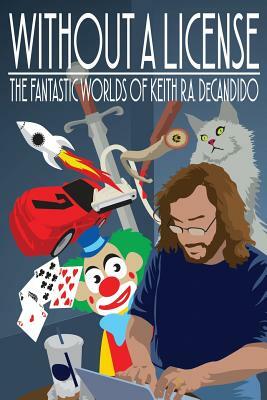 A COLLECTION OF THE FINEST SHORT FICTION BY AWARD-WINNING, INTERNATIONAL BEST-SELLING AUTHOR KEITH R.A. DeCANDIDO FEATURING: A NEW DRAGON PRECINCT STORY & A NEW CASSIE ZUKAV STORY For more than twenty years, Keith R.A. DeCandido has told stories in a variety of universes and genres. Now, some of his finest short fiction from across those two decades are gathered here, plus some new, never-before-published tales of wonder, including a brand-new fantastical police procedural featuring the Cliff's End Castle Guard and a brand-new urban fantasy set in Key West, Florida featuring Cassie Zukav, weirdness magnet, both written especially for this collection From the urban grittiness of "The Ballad of Big Charlie" to the space opera of "The Stone of the First High Pontiff." From the modern-day thriller of "-30-" to the lighthearted cats-and-dogs-and-squirrels romp of "Sunday in the Park with Spot." From a murder mystery in a high fantasy setting in "Partners in Crime" to a murder mystery in a modern publishing setting in "Editorial Interference." From a tale of New York City occupied by magical creatures in "Under the King's Bridge" to a story of Key West filled with Norse gods in "Seven-Mile Race." Plus the short-shorts "A Vampire and a Vampire Hunter Walk Into a Bar," "Wild Bill Got Shot," and "Behold a White Tricycle.